It seems as though every week aquarium enthusiasts are reading about the latest and greatest new gadget. LED lighting with more and more control, macro algae reactors, DC pumps, robotic aquarium cleaners, you name it! Innovations not only drive the industry, but they often provide energy savings and most importantly of all, THEY CREATE A HEALTHIER ENVIRONMENT FOR OUR FISH TO THRIVE IN. While most aspects of aquarium technology have changed, there is one area that has remained stagnant…Mechanical Filtration. Since the early days, people have used some sort of porous material, inserted into the filter by hand, to remove waste from the aquarium. Cotton, filter floss, filter socks. The problem with this archaic system is that until the material is changed, the waste remains in the aquarium, polluting your water. But what if there were a hands-off method of filtering waste- Mechanical filtration that has the ability to automatically change itself when it becomes clogged with particulates? Without further ado, let me introduce you to the exciting world of the FILTER ROLL! 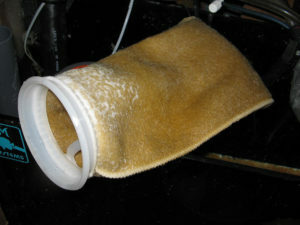 The filter roll is essentially a roll of thin fleece attached to a motor. The water from your tank pours through the fleece removing unwanted waste. Where the motor comes in is what really makes this exciting. A sensor detects when the fleece has reached its capacity, automatically rolling out new material and removing the trapped waste from your water. Some of you may be saying, “We have seen it before,” and you’re right. The first filter rolls hit the market 5 years ago. The downside was their bulkiness and price point. Soon after, another company released a smaller version, more suitable for the aquarium, but still the price at $1000.00 was more than most people wanted to spend. Today however, we are seeing more and more companies creating new and exciting variations. ClariSea for instance has released a new filter roll which achieves everything from an affordable price to a compact size which seems to be able to be integrated into a customers current sump. All innovation in the aquarium industry is exciting, but I think we all can agree that this particular update in technology is a little more exciting than the usual! We at Aquarium Service Professionals are currently testing several different models and will soon be integrating them into our aquarium maintenance business. We at Aquarium Service Professionals truly hope that you found this report interesting. If you have any questions, please feel free to contact us. Aquarium Cleaning Service- How to choose the right company. Aquarium Service Professionals provide full service solutions for aquarium maintenance, food, equipment, decorations, and fish.